The perfect post workout recovery fuel with protein, fat and carbs to refuel and repair your muscles. Preheat oven to 400 degrees F. Spray large rimmed baking sheet with cooking spray. Set aside. Mix chopped potatoes and bell peppers with salt, pepper and garlic. Place in the oven for 45 minutes, flipping half way through cooking with a spatula. When potatoes are done, let cool for 5 minutes and prepare eggs as desired. Over-medium or scrambled is preferred in the Shaw Kitchen! 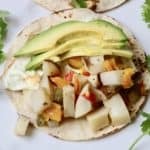 Assemble tacos with 1 tortilla, 1 egg, and 2 ounces of potato and bell pepper blend. Optional to top with avocado, salsa or topping of choice. Avocado not included in recipe analysis.